I love riding my bike because it doesn’t get stuck in traffic. To create this sculpture, thousands of kids built the world’s biggest, gnarliest, clogged-up, crazy traffic jam, while I created a life-size eco-green bicycle triumphing over it all. The traffic jam is built entirely with black LEGO pieces that represent smog and our carbon footprint. The bicycle is eco-green, bright, and giant, symbolizing cycling as a the healthy, Earth-friendly alternative to motorized transportation. I love that this sculpture not only looks elegant, and not only has a great message behind it, but also that it features the inspiration and creativity of thousands of children. I am proud to have created this. I live in New York City, and I ride my bike every day to get around town. I don’t have a car and I advocate for reducing traffic and making the streets safer and more enjoyable for everyone. One morning as I was riding my bike from my home in Midtown Manhattan to my LEGO studio, I noticed that all the cars on the road were completely clogged in traffic in both directions, as far as I could see, traffic was completely stopped. As I quietly, smoothly zipped past everyone in the bike lane, I realized, “I love riding my bike, because it doesn’t get stuck in traffic!”And I immediately had the vision for this sculpture: A life-size bicycle, towering over a clogged up crazy traffic jam built by kids. The sculpture was built at the Brickmagic LEGO fan event in Raleigh NC May 2011. Over the course of two days, thousands of kids (and adults!) 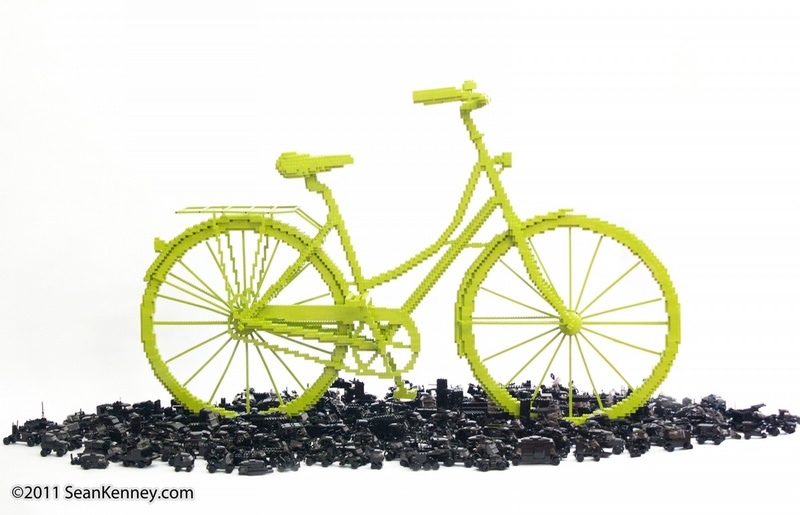 built the world’s biggest, gnarliest clogged up, crazy traffic jam using over 75,000 black LEGO pieces, while I created a life-size eco-green bicycle triumphing over it all. It was an amazing success! There were thousands of crazy cars, the likes of which I’d never seen before; I was totally impressed and everyone’s creations were way cooler than I ever could have imagined. I love that this sculpture is not only something that looks beautiful, and also has a great message behind it about making smart transportation choices, but also that it represents the inspiration and creativity of children who not only rushed in to help create the crazy traffic jam, but who did so with such fervor and excitement! I am proud to have been able to create something like this. The whole sculpture was set up in an art gallery show the following week in New York City along with some of my other artwork.